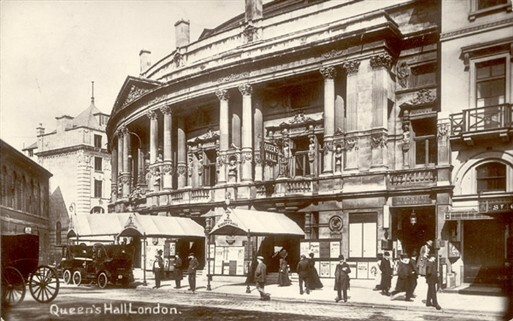 The Queen’s Hall, Langham Place W1 – venue for the popular Proms concert series – experienced minor blast damage in raids carried out on 8 December 1940 and 16 April 1941. It was completely destroyed in the heavy Luftwaffe night raid of May 10-11 1941. Built in 1893 by architects Thomas Edward Knightly and C.J. Phipps, the Queen’s Hall was from 1895 the much-loved home of the Promenade classical music concerts (from 1927, the BBC Proms) created by conductor Sir Henry Wood and managed by Robert Newman. The 3,000-seat neoclassical building – with seventeen public entrances – was the West End base for the London Philharmonic and BBC Symphony Orchestras and acquired a reputation for exceptional acoustics. Sir Henry Wood conducted performances at Queen’s Hall up until September 1940. 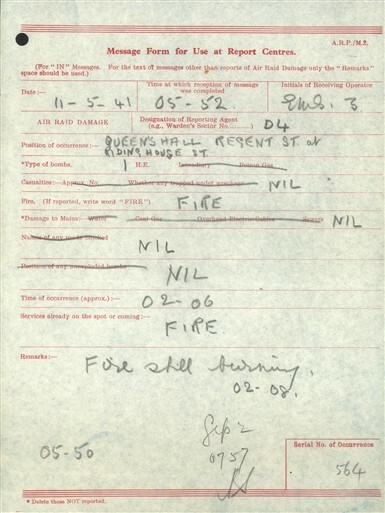 At around 11pm, 10 May 1941, hours after an afternoon performance of Edward Elgar’s ‘Dream of Gerontius’, conducted by Malcolm Sargent, a single incendiary bomb hit the roof of the Queen’s Hall. Two fire-watchers initially succeeded in extinguishing the burning device, but it re-ignited. The entire roof was engulfed by flames. 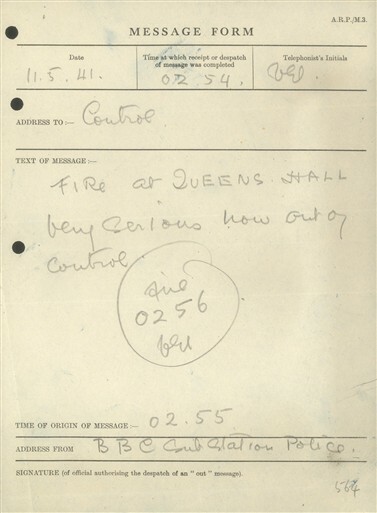 With the Auxiliary Fire Service struggling to deal with dozens of local incendiary blazes, fire engines could not get to the Queen’s Hall until after 2am. Even then, no water was available until 4am. A Police message received by the St Marylebone Report Centre at 2.54am, 11 May described the fire as “very serious, now out of control”. By dawn, the auditorium had been completely burnt out, along with all the London Philharmonic’s instruments. Only the blackened supporting walls were left. No casualties were reported but one eyewitness likened the Hall’s devastated appearance to the remains of ‘a Roman arena’. A bronze bust of Sir Henry Wood – now displayed each year at the Royal Albert Hall during the BBC Proms season - was salvaged from the Queen’s Hall’s ashes. The London Philharmonic and BBC Symphony Orchestras quickly relocated to the London Coliseum. They were soon performing again but the loss of Queen’s Hall was profoundly upsetting for Sir Henry: he died in 1944. Also lost during the Blitz was the St George’s Hall, built in 1865 and located next to the Queen’s Hall. 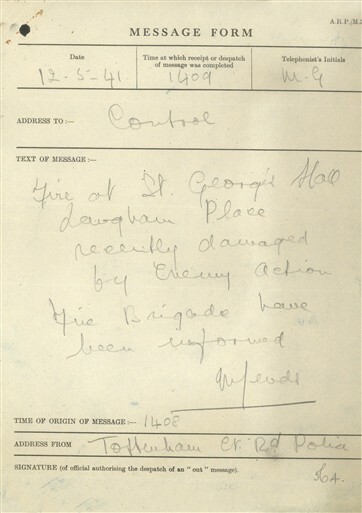 St George’s, home to BBC Variety performances from 1933 and possessor of a famous theatre organ, was set alight by incendiaries dropped on the night of 24 September 1940. The whole auditorium burnt to the ground and its organ was destroyed. Today, the former site of the Queen’s Hall and St George’s Hall is occupied by the St George’s Hotel (1963) and BBC offices at Henry Wood House, 3-6 Langham Place. This page was added by Ronan Thomas on 01/09/2010. I remember reading that a fragment of wall from the Queens Hall still survives and the faded Stage Door painted sign is visible. Does anyone know where this is exactly?